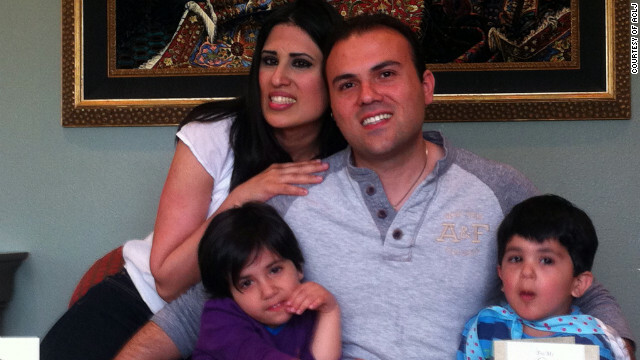 Saeed Abedini, an Iranian-American citizen imprisoned in Iran, is seen with his family. Editor's Note: Nina Shea is the director of the Center for Religious Freedom at the Hudson Institute and one of the authors of "Persecuted: the Global Assault on Christians." Merely having the Christian Scriptures, which likely were smuggled across the border from China, put the unknown woman under suspicion of converting to Christianity, and perhaps even sharing her new faith with others. Our research, drawn from United Nations studies, U.S. governmental sources, newspaper accounts and documentation from churches, think tanks and human rights groups, found that in North Korea, Iran, Saudi Arabia and elsewhere, Christian conversion is treated as a capital crime or otherwise severely punished. The right of conversion, as long as it is not forced, is an integral part of the fundamental human right to religious freedom. Yet, as we document in our new book, "Persecuted," in many countries, in various parts of the world, and stemming from various motives, religious conversion draws horrific reprisals. Persecution for conversion to Christianity – a faith with the “Great Commission” to share the Gospel - is rising globally, along with persecution of some very long-established, even 2000-year-old, Christian communities. Persecution typically happens in places where Christians are a minority, where communist ideology still holds sway, in the Muslim world, or where conversion is seen as a threat to national identity. Iran is a prime example of the growing number of states that harshly punish converts for apostasy from Islam. In January, the Rev. Saeed Abedini, an Iranian-American citizen, was sentenced to eight years imprisonment in Tehran’s brutal Evin Prison for his own conversion, as well as for his ministry with Iran’s burgeoning underground evangelical churches. Another Christian pastor, Yousef Nadarkhani, who was first jailed in 2009 and sentenced to death, was released from prison earlier this year after international pressure. In September 2012, the U.N. special rapporteur on human rights in Iran, Ahmed Shaheed, said “scores of other Christians appear to remain in detention for freely practicing their religion,” and that over the past two years more than 300 Christians have been arrested and detained arbitrarily in Iran. These arrests result from accusations of proselytizing. In Egypt, perceived apostates face many difficulties. In January, an Egyptian court sentenced Nadia Mohamed Ali and her seven children to 15 years imprisonment for reconverting to Christianity. Born a Christian, Nadia converted to Islam in order to marry a Muslim man; after his death, she returned to Christianity and ran into trouble when she had the family's official identity cards changed to reflect this. Saudi Arabia requires all its nationals be Muslims and can punish apostasy with beheading. Christian converts also risk honor killings, being murdered by their relatives. In 2008, Gulf News reported that Fatima Al-Mutairi was “burned to death and her tongue had been cut out” by her Saudi father, a religious policeman, after her brother discovered a photo of a cross on her computer screen. A 2012 study by the Washington based Pew Research Center found that proselytism, or talking about one’s faith to others, was specifically restricted by central or local governments in 66 countries. An example occurred on March 10, 2013, in Libya, where Ezzat Hakim Atallah, a 45-year-old Coptic Christian from Egypt, was reported tortured to death with electric shocks by security police in order to exact a confession of proselytizing. Five other Copts detained with him remain jailed. Though India is renowned for its religious pluralism, various states in India, influenced by Hindu nationalists, have anti-conversion laws. Ostensibly to protect against coerced conversion from Hinduism, some are so vaguely worded that even spiritual benefits or charity work could be deemed illegal inducements. The worst abuses occur when, stirred by their local political and religious leaders, Hindu mobs riot against entire Christian families or villages. In fact, around the world, the Pew Research study finds generally that social hostilities are 2.5 times higher when governments limit conversion. Vietnam’s leaders seem to view converting to Christianity in northwest provinces among the Hmong and in the Central Highlands among various ethnic tribes to be a security threat. In addition to suffering beatings and imprisonment and having their homes torn down and property confiscated, some converts there have been forced to “reconvert” to traditional practices of ancestor worship. Converts to various other faiths are persecuted as well, usually by the same forces that punish Christian conversion. Members of the Bahai faith, a religion that acknowledges a prophet after Islam’s Prophet Mohammed, are deprived of all constitutional rights in Iran and their entire leadership is serving a 20-year sentence. Similarly, the Ahmadi Muslim community is targeted under blasphemy laws in Pakistan. Converting others to Islam is punished in parts of India by Hindu nationalists. Koranists in Egypt and outspoken moderate Muslims in Saudi Arabia are persecuted for their unorthodox beliefs. Couched in U.N. diplomatic language, this is a sound of alarm. Recent decades have seen the rapid global spread of Christianity and many thousands of Asians and Africans who are choosing to become Christians are paying a very steep price. It is time that the West, including Western Christians, end their indifference and recognize this for what it is: an egregious human rights violation. The opinions expressed in this commentary are solely those of Nina Shea. Why no reactions from The International Human Rights? Do not stand by idly as they die. You're responsible morally. Go to Google's news aggregator and type Christians Attacked, no quotations marks. Repeat the search frequently, anytime. A theme will emerge. The whole story of Christianity needs persecution to legitimize it, if they aren't persecuted they will make it up. While I agree that religous people should be punished for violating every ethic and moral ever conceived, I draw the line at shooting them because there would not be enough resources to dispose of the billions of bodies throughout the world. People of faith, if that is what you mean, have every right to practice their beliefs. They should not be punished in any way for it. It's idiots like you who do not believe in anything that claim to know the truth which is bull crap. Its people like you who take the law into your own hands and end up killing innocent people. Sig heil, Kilto. Look what being a Christian did for the Germatic Jews. Shut up.